Leading Manufacturer and Wholesaler from Ahmedabad, our product range includes Gearless Elevators such as MRL Gearless Elevators and Machine Roomless Elevators. Owing to our sincere business standards and transparent deals, we are steadily making our way to the platform of success by offering a supreme quality MRL Gearless Elevators. 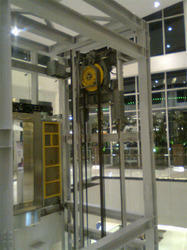 The provided elevators are driven by the smallest gearless machine. Under the strict supervision of our adept professionals, the offered elevators are manufactured using advanced technology and quality approved components in sync with the set market standards. Additionally, these elevators are also tested on various quality norms by our quality analysts to ensure their smooth and noiseless operation. We have marked a trusted position in the domain by providing a wide gamut of Gearless Elevators. 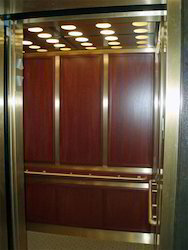 The provided elevators are well suited for carrying people and goods to the desired levels at various places. 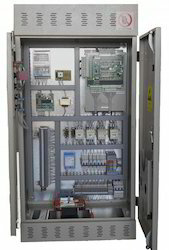 These elevators are precisely manufactured by utilizing excellent grade components under experts’ supervision. In addition to this, the provided elevators can be availed from us at nominal prices. Backed by our flourishing business processes, we are able to offer a superior quality range of qualitative Machine Roomless Elevators. The offered elevators are highly demanded by our clients owing to their efficiency and easy installation. these elevators are manufactured under the vigilance of adept professionals at our well-equipped production plant. To ensure timely and damage free delivery, the provided elevators are examined on diverse parameters by our quality auditors in sync with defined market standards. The use of the MRL elevator will save a significant amount of energy (estimated at 70-80%) as compared to hydraulic elevators. The power feeders for the MRL are also significantly reduced due to the more efficient design and the counter-balancing provided with traction equipment. The MRL elevator eliminates the cost and environmental concerns associated with a buried hydraulic cylinder filled with hydraulic oil. Over the years hydraulic elevators have come under greater scrutiny relative to environmental concerns due to the buried hydraulic cylinder. Because the MRL elevator is a traction elevator with all its components above ground, this is not a concern for this equipment. The MRL elevator utilizes a gearless traction type machine, which results in superior performance and ride quality compared with hydraulic elevators. MRL’s can also operate at faster speeds thus increasing the perception of quality over a conventional hydraulic elevator. With a focus on the ever-evolving demands of our customers, we have come up with a wide range of uniquely designed Machine Roomless Elevators. 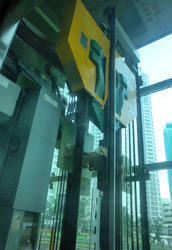 These elevators are machine room less, no other space is needed than the hoist way. 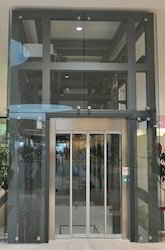 Our offered elevators are manufactured using supreme quality components and the latest technology under the direction of experienced professionals at our manufacturing unit. Our provided elevators are widely praised owing to its features like high efficiency, smooth & noiseless operation and longer service life. We are Leading Manufacturer and Supplier of Gearless Traction Elevator From Ahmedabad,Gujarat. Backed by rich expertise in this domain, we have been capable of manufacturing, exporting and supplying a quality assured range of Gearless Elevators. 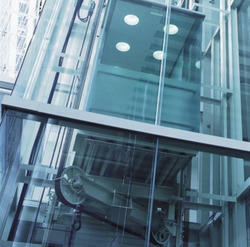 Our offered elevators are well known for its smooth operation and high energy efficiency in the market. The provided elevators are used to move any type of goods from one floor to other floors. The elevators offered by us are manufactured using superior grade components and pioneered technology by our skilled professionals. In a gearless traction machine, five to eight lengths of wire cable, known as hoisting ropes (or wire ropes), are attached to the top of the elevator and wrapped around the drive sheave in special grooves. The other ends of the cables are attached to a counterweight that moves up and down in the hoistway on its own guiderails. The combined weight of the elevator car and the counterweight presses the cables into the grooves on the drive sheave, providing the necessary traction as the sheave turns. To reduce the load on the motor, the counterweight is calculated to match the weight of the car and a half-load of passengers. As the car rises, the counterweight descends, balancing the load. This reduces energy consumption because the motor is required to lift no more than the weight of half a car load at any time. The grooved sheave in this traditional gearless system is quite large, from 0.6 to 1.2 meters (2–4 ft) in diameter. 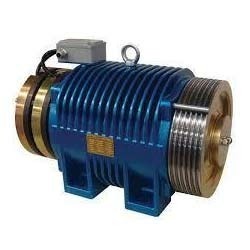 The electric motor that runs it must be powerful enough to turn this large drive sheave at 50–200 revolutions per minute in order to move the elevator at the proper rate. Safety is provided by a governing device that engages the car’s brakes, should the elevator begin to fall. A powerful clamp clutches the steel governor cable, which activates two safety clamps located beneath the car. Moveable steel jaws wedge themselves against the guiderails until sufficient force is exerted to bring the car to a smooth stop. Elevators with more than 100 ft (30 m) of travel have a system called compensation. This is a separate set of cables or a chain attached to the bottom of the counterweight and the bottom of the elevator cab. This makes it easier to control the elevator, as it compensates for the differing weight of cable between the hoist and the cab. 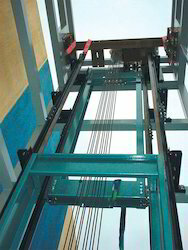 If the elevator cab is at the top of the hoist-way, there is a short length of hoist cable above the car and a long length of compensating cable below the car and vice versa for the counterweight. If the compensation system uses cables, there will be an additional sheave in the pit below the elevator, to guide the cables. If the compensation system uses chains, the chain is guided by a bar mounted between the counterweight railway lines. Looking for Gearless Elevators ?